A rare and true-life seafaring adventure story with a difference! 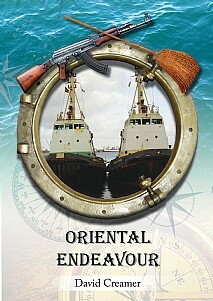 As a sequel to the successful Rats, Rust and Two Old Ladies, the story of Oriental Endeavour begins when the author delivers a tugboat from Avonmouth to Buchanan in war-torn Liberia. Four years later, he is asked to command one of two tugboats for delivery from West Africa to Singapore and, despite being renamed, he soon realises this is the same boat. Along with its sister, Oriental Tug No. 2 has been terribly neglected whilst in Liberia and requires extensive repairs at Las Palmas. The 11-day trip becomes particularly memorable due to a funnel fire, the discovery of a stowaway, a wheelhouse that is no longer water-tight and bad weather. En route to Malta they are battered by a violent storm and Roland, the unfriendly rat, is sighted. After a short stay in fly-infested Djibouti, they successfully avoid Somali pirates in the Gulf of Aden and attempt their first crossing of the Indian Ocean which is thwarted by further machinery failure and partial flooding of some cabins. After 13 weeks they arrive in a muddy backwater creek in Singapore where the owner mysteriously declines to show his face. Before sailing from Buchanan the ships were visited by employees of timber companies involved in gun-running and the illegal stripping of Liberia’s hardwood forests. Were blood diamonds from Sierra Leone concealed on board? Ex-President Charles Taylor of Liberia is on trial at the Hague – will the truth ever be known? This humorous and unforgettable adventure story will be of enormous appeal to anyone interested in real-life stories, maritime tales, tugboat enthusiasts, all armchair sailors and anyone looking for an engrossing read.